Farm Girl Adventures: Alpaca Fiber! In one of my recent posts I talked about moving on to natural fibers as opposed to synthetics. All I've ever worked with was synthetics, due to a mistaken assumption that I was allergic to wool. I am apparently not! So now in addition to weaving, crocheting, and knitting with wools, I am excited about felting! I have one project that was felted by mistake, a knit scarf. It was thrown into the washer on a normal cycle by mistake, but I love the result! My second project with natural fiber was a happy accident. John and I were out exploring and decided to take a ride on the Blue Ridge Parkway. Not long into our journey we happened upon an Alpaca farm! As critter crazy as we are, of course we had to stop! Their shop is filled with the most beautiful garments and fiber. 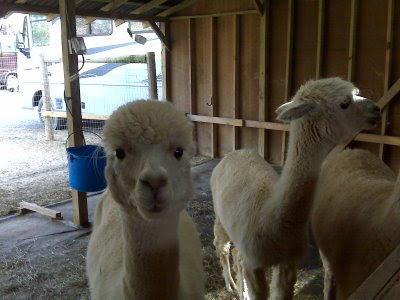 We spent a couple of hours talking to the owner, who allowed us to go out to the barn and see her amazing Alpacas. They are the most calming creatures to be around. We kept hearing them 'hum', which is a very musical sound. A couple of them are very tame and we were able to feed them grain from our hands. We so much enjoyed the visit and learning about Alpacas. The fiber is so soft and wonderful to work with. I bought a skein to make a lacy scarf. Here it is, almost finished. I am planning to add some wooden or glass beads to the ends. 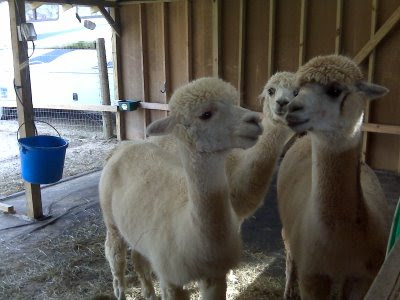 The site for the farm is http://www.peacefulheartalpacas.com/ if you are interested in taking a look. Without a doubt some of the cutest animals I have ever seen ! 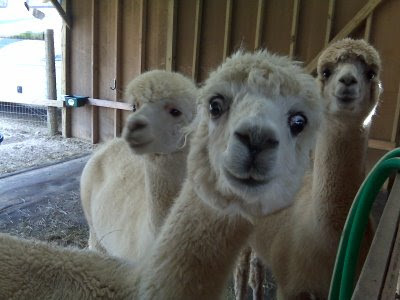 I love that 3rd photo with the alpaca looking right into the camera. You have a wonderful passion for animals, life, and creativity!